Sorry but the picture shows 4 pots this auction is for 1 x 500ml pot only. It is a ideal for use in kids rooms, playhouses, schools etc. Chalkboard Paint used to create a truly unique surface. 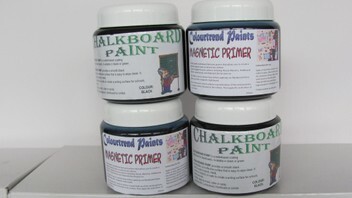 * Chalkboard Paint can be used over sealed timber, Wood, Metal , plaster, glass, Gib-board, Custom wood, plywood etc. Underseal in Brush or spray, Cavity Wax to penetrate seams for rust protection on Vehicles, Includes a range of cleaning products.